A Tampa dojo owner is under police investigation after parents say he took their money, their kid's uniforms and their certificates then closed up shop. 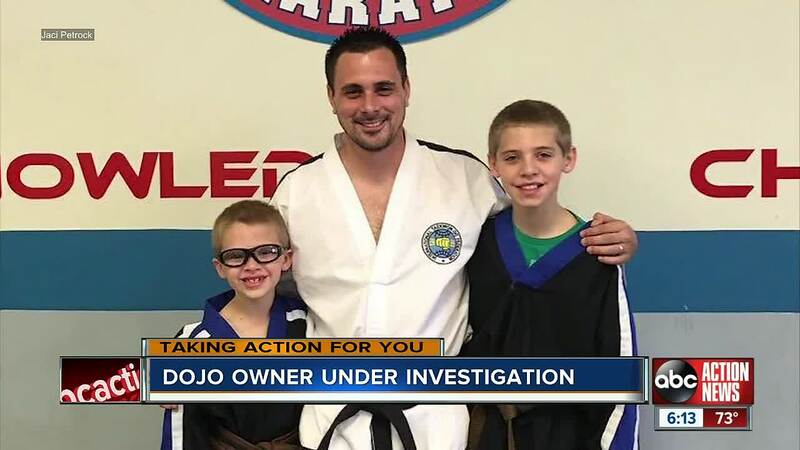 TAMPA, Fla. — A Tampa dojo owner is under police investigation after parents say he took their money, their kid's uniforms and their certificates then closed up shop. Jaci Petrock says she paid Edward Schew of Integrity Taekwondo more than $600 last March for black belt uniforms and certificates. She says her sons never received them. “I would like to see my kids get what they deserved,” said Petrock. But more than money, Petrock wants to know if Schew carried liability insurance. She says her oldest son, Taylor, is still undergoing treatment for a traumatic brain injury he suffered at the studio last spring. Taking Action Reporter Jackie Callway found Schew leaving out of the back door of his closed studio. “My name is Patrick,” Schew said, pretending to be someone else. He wouldn’t answer questions about the money parents say he hasn’t returned. “I have no idea what you are talking about but thank you," he said. He walked through an overgrown lot, a fence and into a restaurant parking lot where he got into his SUV. Parents say Schew told them he was opening a new studio in Carrollwood, but so far there’s only the closed studio. “I’ve told everybody where it is,” he told us when we asked about the location of the new studio. We spoke to Hillsborough County Sheriff's Office deputies, who say they've opened an investigation into the parent's complaints that their money hasn't been returned.